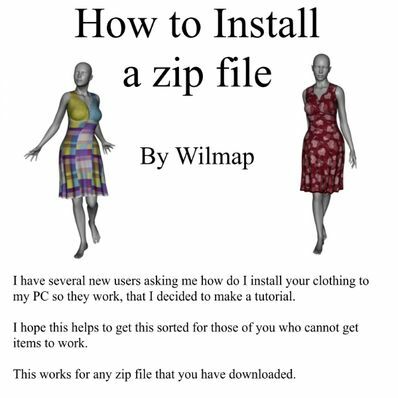 I have made a quick tutorial to help those who are having problems getting downloaded ZIP files to install correctly. Hope it helps. This file is in Word format. Thanks so much, people always need tutorials. These tutorials are wonderful! Now when someone asks me I can send them here. Thank you very much. I am very grateful to you. I just added stuff with Daz. Sometimes she stays texture spots and large patches. The other day, do your homework and could not do. Could not change the texture in Daz.))) Now do even as you write. Please accept my best wishes. Sincerely, Radyga.